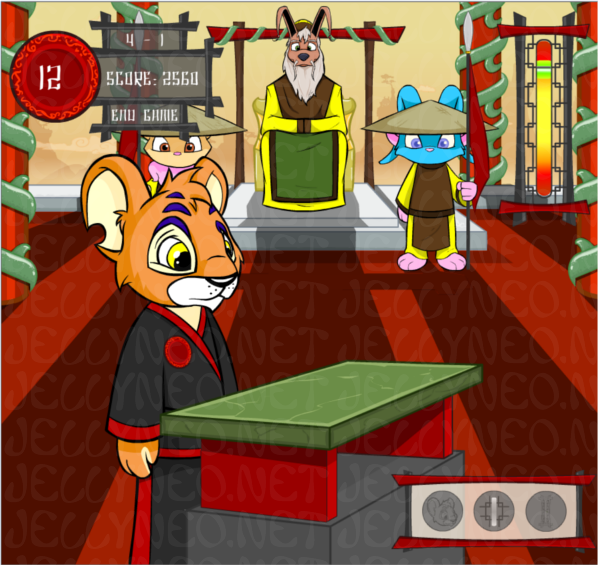 In this karate-chopping match against time, you play as Katsuo, a young Kougra who has been training in martial arts to get into the Imperial Guard. You'll be faced with 12 blocks to chop in order to prove your mastery of martial arts. you can't break the block when the tiny random insect - the moffit - appears. There are two main strategies here: either aim fast or wait until the insect jumps away. You can use this time while the moffit is blocking you to get your bearings on the timing of the meter and line up the perfect break. Points are awarded based on your speed and accuracy. This is the first location and contains three sublevels (three blocks to break). The meter moves at a constant speed, the flowers floating in front of the meter move slowly and only minimally block the view, and the moffit only shows up after several seconds. In this level, the meter starts and stops as it moves up and down, the flowers get in the way more, and the moffit pops up more often. This location contains four sublevels and would be the "medium" difficulty level. This location is the "hard" difficulty. The meter operates in a far more complicated manner, and there is an Acara guard standing beside it that covers it entirely with his flag every so often. Although the moffit does not bother you on this level, the meter, of course, moves really quickly by this time. The one nice thing is that there are no flowers floating around to distract you... just the big flag. See that trusty green region you've been so reliably hitting? It moves now. The line that marks your chop now moves rapidly, starts and stops more and more frequently, and also changes speed. Fortunately the green region doesn't do that, it only moves up, pauses, moves down, pauses, etc. But it takes a lot more concentration to line up the moving line with the moving green region and to hope the flag doesn't end up in front of it when their paths cross. Sheva suggests that you try to hit the green when it's at either the top or bottom of the meter so that you have extra time to hit since you can bounce off the edge of meter. If you are very lucky and very skilled, you'll be asked to demonstrate your chopping skill for the Emperor himself! This level is basically a souped up level 3--the Acara guard and moving meter are still there, but you have the added difficulty of making sure the emperor is watching you (has his eyes open toward you) when you strike the board. Plus, your kougra is in a spiffy new black robe, but that's just a bonus. The requirements for reaching this level are as follows: you must have a perfect hit (in the white zone) on levels 3-3, 3-4, and 3-5. Pretty high expectations, but a ninja like you is up to the task, yes? A huge thanks to Grog for this screenshot! This powerup is essentially an extra life powerup. You get a rare chance to try a second time to break the block. This one is soooo very handy. This powerup increases the size of the green region on the meter so it's easier to chop the block. Most helpful in the Emperor's Grand Hall when the green region is impossibly tiny and moving. This powerup slows down the sliding line so that you can time the chop more easily. With this you don't have to be ready to hit space before the line hits the green zone; you usually have time to react to actually seeing the line hit the edge of the green. This is nice for the stopping-and-starting levels. Top Chop previously gave out several exclusive karate gi wearables, which can be seen here. While the white gi and three of the belts are fairly common even today, the black gi and belt seem to have never been given out. You'll never find me! NEVER! And that's about it. In my experience, once you understand the way the game works, it's only a matter of practicing over and over again to get the timing. It's a game of how-long-can-you-last-before-you-make-a-mistake, so practice is everything. Hope this helped, and happy chopping!